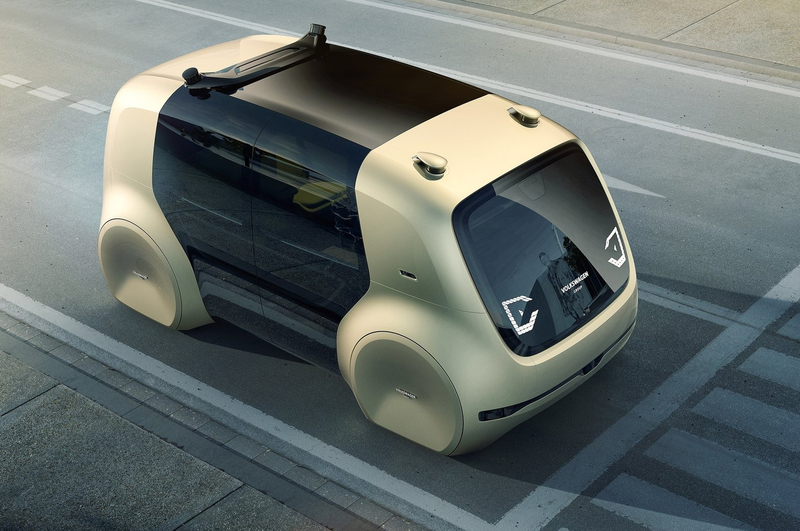 I’m convinced that there must be some unwritten rule which dictates that concept vehicles be so ugly that you’ll never actually want one… like Volkswagen Group’s first self-driving car. An Autonomous Level 5 vehicle, Sedric (self-driving car) will be capable of driving itself without human interaction (there isn’t a steering wheel or pedals). As Jalopnik reminds us, this isn’t really a car as we understand them today but rather, a robot that takes you places (or as The Verge says, something akin to a pet). Good thing, too, because as the latter publication correctly highlights, it looks like a pissed-off toaster. Exterior aesthetics aside, the miniature monorail clone looks quite luxurious and spacious inside and reminds me a lot of the excellent Microbus concept we saw at the Detroit Auto Show back in January. Without the need to face forward and drive, occupants can gather around in a lounge-style setting that fosters a more intimate feel. Naturally, there are large OLED panels with augmented reality to entertain riders as well. There’s even “green” technology onboard in the form of air-purifying plants positioned near the front and rear windshields. Assuming they are real, one has to wonder how they’d survive when the climate control is off. Then again, we have to remind ourselves that it’s just a concept and won’t ever hit the road in this iteration.